The U.S. Department of Energy's Better Buildings Challenge program recognized the university for its Energy Management Initiative, an approach to linking energy costs to building occupants in its Jacobs Hall facility, an interdisciplinary learning hub. After just five months in operation, the building expects energy savings of 65 percent, or $41,000 dollars. 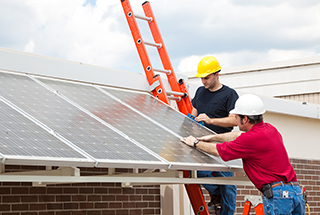 Through the Better Buildings Challenge, the Department of Energy aims to achieve the goal of doubling American energy productivity by 2030 while motivating leaders across the country to save energy through commitments and investments. 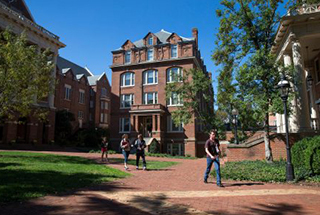 The 108-year-old residence hall now includes a new heating, ventilation and air conditioning (HVAC) system, high efficiency faucets and toilets, access to public transportation, low-emitting materials and energy efficient light controls. 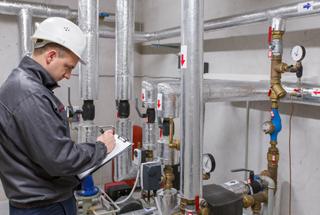 The university partnered with the State of Ohio to conduct free energy audits of area buildings that help identify simple fixes and low-cost recommendations that could conserve energy and reduce operating costs. 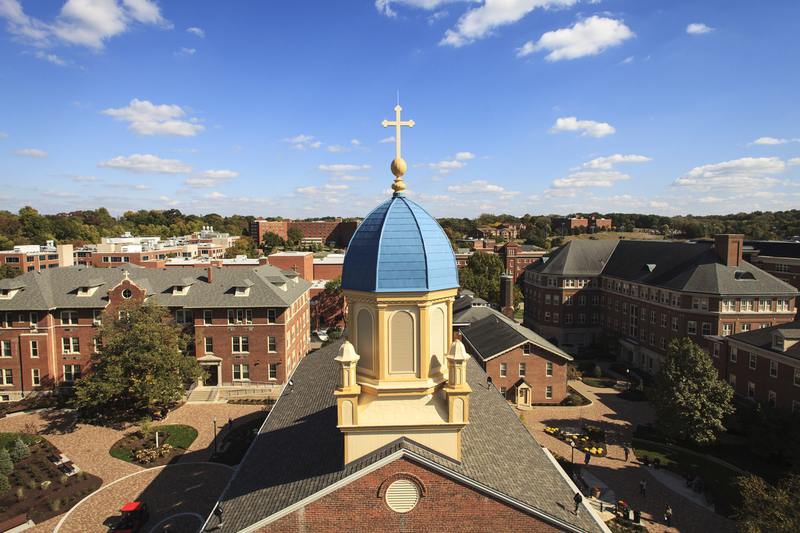 The initiative was made possible through a grant that the university’s Department of Mechanical Engineering received through the Ohio Lean Building Program, which is managed by the University of Dayton. 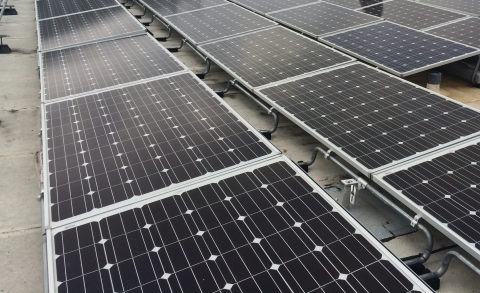 Projected to meet approximately 10 percent of the university electricity demand, the two-megawatt photovoltaic system is expected to be complete in 2016. Under a 25-year power purchase agreement, the university will purchase electricity directly from the array without needing to invest capital in construction and maintenance. The newly constructed building uses water-efficient landscaping and plumbing fixtures, was built to allow 75 percent of spaces to have an outdoor view, contains 22 percent local materials and recycled 51 percent of construction waste. 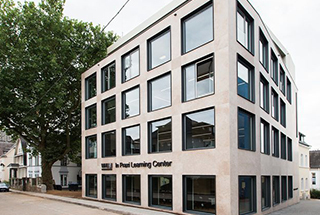 The university is the first founding partner from the higher education community to sign on to Portico, a web-based application designed to simplify the analysis, selection and specification of building products that meet health and transparency objectives. Harvard’s Office for Sustainability and the Harvard T.H. Chan School of Public Health's Center for Health and the Global Environment will partner with Healthy Building Network and Google to foster opportunities for faculty and students to use the data available to generate new research and support existing initiatives on healthy buildings that are already underway at the university. 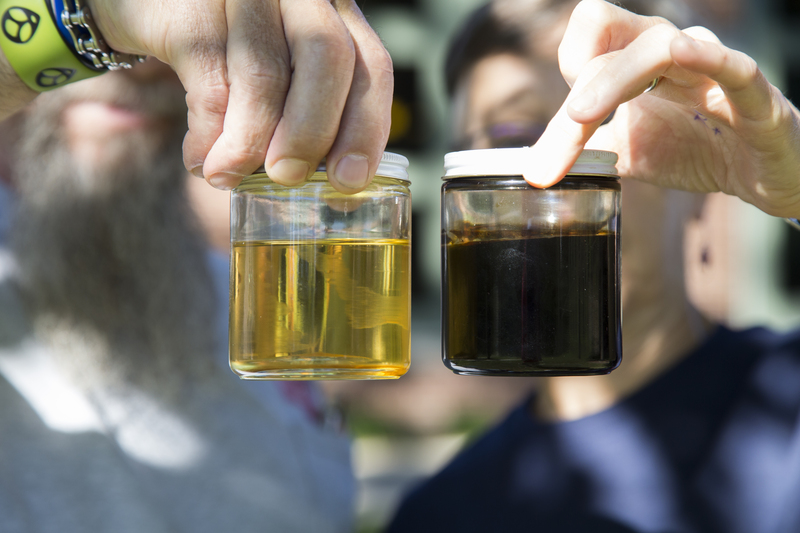 In a Campus Sustainability Month announcement, Keene stated it is using 100 percent purified waste vegetable oil to heat approximately 36 percent of campus. During August 2016, the college met the demand for heat and hot water using this fuel, which is helping the college reduce carbon emissions. The new 640-bed, residential building includes views to the outdoors for 95 percent of occupied spaces, 90 percent of wood used was Forest Stewardship Council-certified and on-site filtration of storm water. The new building minimizes consumption of water and energy, project materials contained recycled content, almost 50 percent of materials were manufactured in the region, and the project diverted more than 75 percent of construction waste from entering a landfill. (Germany) The new building features a climate control system that includes two wells for groundwater that is used to cool the building. This is coupled with a software-controlled ventilation system that allows the air inside the building to mix with outside air to result in an even distribution of temperature without temperature stratification. 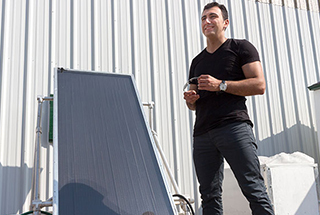 Located in a cold-weather climate with an average of 174 sunny days per year, students, in collaboration with the Sustainability Office, are involved in testing the efficacy of flat plate collectors versus evacuated tubes to determine the best renewable energy solution for campus' hot water. 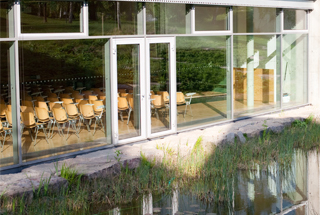 The university's High Density Library features rainwater and snowmelt capture from the roof and landscaped areas in a stormwater pond that's used then treated through a constructed wetland, high-efficiency lighting and mechanical systems, a light-colored roof membrane to reduce heat absorption and for most staff, a direct line of sight to windows to contribute to a healthy workplace. The building features a focus on water use reduction, the optimization of the building’s energy performance and indoor environmental quality. The result of approximately two years of planning resulted in planters set up on the college's student union roof filled with varietals of Sedums, which are plants well suited to rooftop gardens. The planters are supposed to absorb heat and ease the thermal load of the building. Three residence halls will be the recipients of photovoltaic arrays to support research on how solar energy can be combined with other demand-side resources, resources such as battery systems. 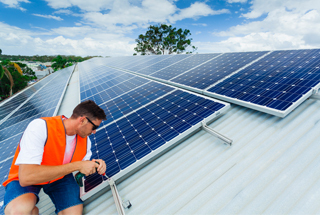 Seattle City Light's Green Up program is contributing $225,000, which enabled the university to compete for the Washington State Department of Commerce Solar Grant Program that is providing $225,000 in matching funds. 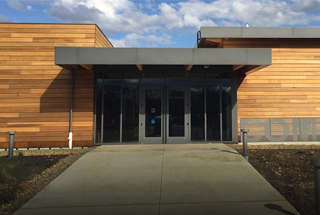 The one-year old building features a 65 percent reduction in energy costs through structural design and passive solar orientation, solar power generation, natural light, recycling and re-using grey water to flush toilets, and a focus on energy efficiency. 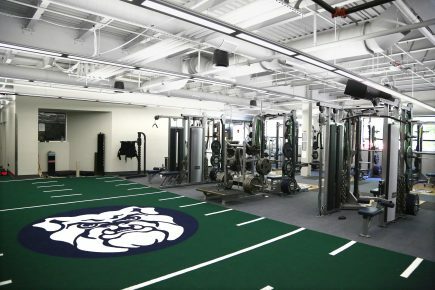 A $34 million renovation of the university's Hinkle Fieldhouse includes new roof with a white cap sheet that reflects sunlight, bicycle storage and changing rooms, low-flow water fixtures and a two-year contract to purchase at least 35 percent of the building’s electricity from renewable sources. A key step in reaching the university system's goal of carbon neutrality by 2025, electricity produced by a recently completed, 60-megawatt (MW) solar farm will be purchased by the university, with nearly one-quarter going to UC Davis. The 60MW represents approximately 14 percent of the system's total usage and the university notes that an additional 20MW solar installation is set to come online by mid-2017. The recent article looks at the College of Wooster and the College of Charleston, which have designed student housing that embraces the concept of tiny living, offering relatively few square-feet per student, while at the same time offering large community spaces to bring students together. 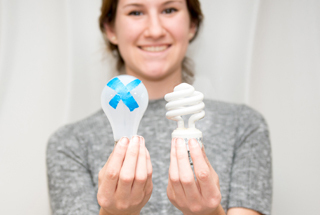 Replacing 540 compact fluorescent fixtures with 330 LED ones and dimmers was $200,000 and has been estimated to cut the college's power use by 80-kilowatts per month. The college will receive $16,000 in energy-efficiency rebates. After seeing a presentation on Clean the World, an organization dedicated to making hygiene products accessible to people worldwide, the university-owned hotel was able to divert nearly two years worth of leftover soap and shampoos, totaling over 6,500 pounds, to the organization. The 46,000 square foot, John J. Sbrega Health and Science building is a zero net energy classroom and science lab, and features a photovoltaic system along with an air source-ground source heating and cooling system, which combined allows the building to move away from fossil fuel usage. Other sustainable building elements include solar hot water production, efficient LED lighting and filtered, ductless fume hoods. 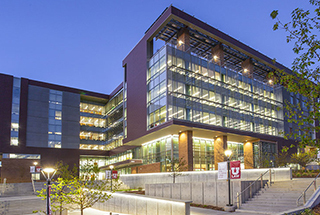 The new building at the university's Brigham City campus joins nine others at USU with LEED Gold status and features fixtures designed to use approximately 46 percent less water than traditional fixtures, energy efficiency and 44 percent of the building’s materials were extracted, harvested or manufactured within 500 miles. The U.S. Department of Energy’s Interior Lighting Campaign awarded the university top honors in two categories: Best Use of Lighting Controls in a Single Building and Exemplary Higher Education Sector Site. Overall, the 2016 Interior Lighting Campaign recognized 13 organizations for exemplary performance in their application of high-efficiency lighting systems. The university's newly renovated and expanded Campus Recreation Center features 80 ground-source heating and cooling wells, landscape designed to lessen water consumption and energy-efficient mechanical systems. Over the last several years the Student Operation for Avian Relief (SOAR) project has identified the large east facing windows of the university's Norville Center for Intercollegiate Athletics as being particularly dangerous for migrating birds. As a result, the Facilities Department worked with Athletics to design and install a decal that should reduce bird collisions. SOAR will monitor avian impact during the upcoming fall migration period. The university's Natatorium will be ready to operate as a zero-waste athletic facility in June, becoming the first athletic facility in Indiana to achieve zero-waste goals and hosting the first Olympic event to have the zero-waste designation. Being a zero-waste venue means that by weight, 90 percent of all waste must be recycled or composted. Only 10 percent may be disposed of as trash. 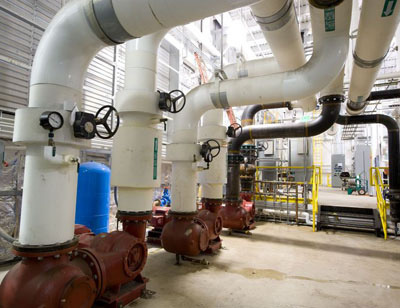 The university now purchases energy from three hydro-energy facilities that provide over $200,000 in annual cost savings. Currently 88 percent of the university's total power comes from a combined heat and power plant. 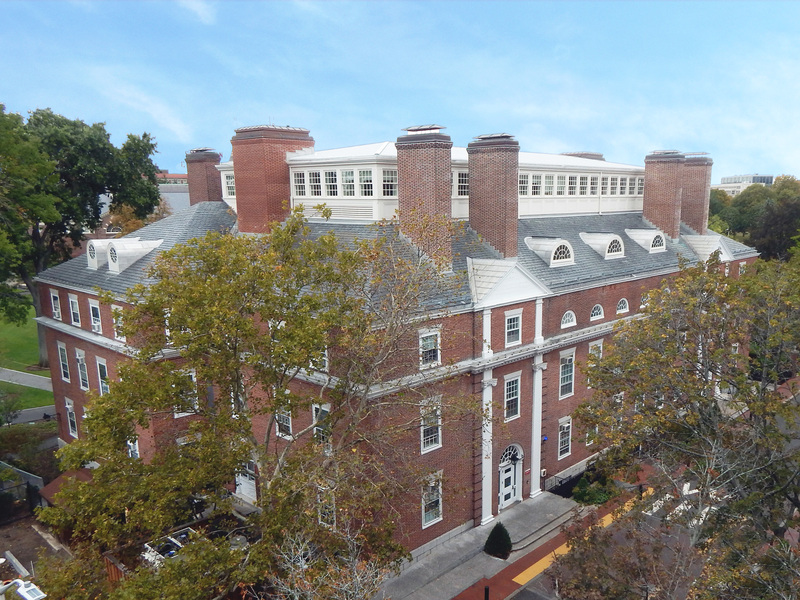 Last updated in the 1940s, improvements to Longfellow Hall’s infrastructure included efficiency updates to the boiler plant, installation of energy recovery units for enhanced ventilation, substantial insulation upgrades to ensure reduced energy usage and the use of step-dimming. The building is expected to use 39 percent less lighting power. The 2015 ENERGY STAR National Building Competition results revealed Texas A&M University taking first place with an overall energy reduction of 35.5 percent while Emory University achieved a 12 percent reduction in energy use. Hosted by the Environmental Protection Agency, the competition brings together teams in order to reduce energy and water consumption. Learn about the strategies that Texas A&M and Emory employed in the competition's wrap-up report. 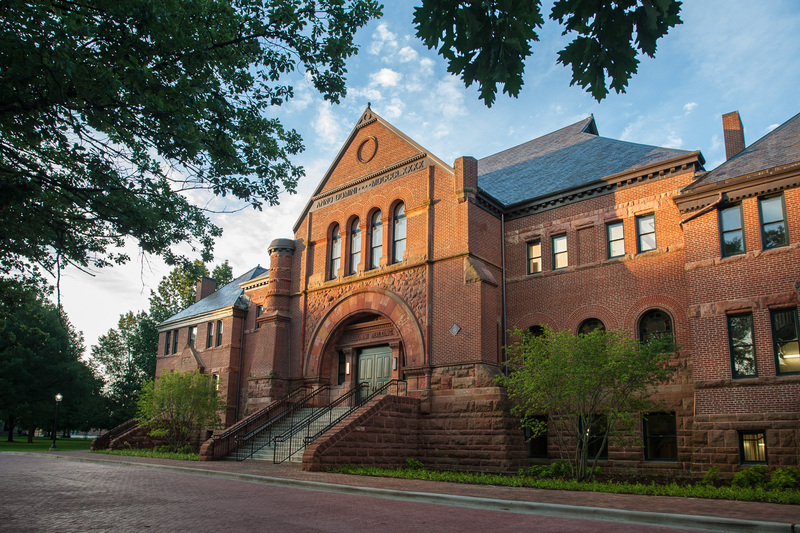 The recently certified, 2014 renovation of the university's Alumni Hall features LED lighting, water control systems, fresh air exchange, occupancy sensors for lighting and ventilation, and reused material from the original building. The new $1.5 million Sustainability Revolving Fund will be a self-replenishing program that will be used to fund capital-intensive energy and water efficiency projects across campus. The program is made possible by a $500,000 grant from The Kendeda Fund. The grant was matched by a $1 million investment by the university. Part of the community college's Sustainability Technologies Program, the newly approved Building Construction Technology program will attempt to help students build better using sustainable technologies. 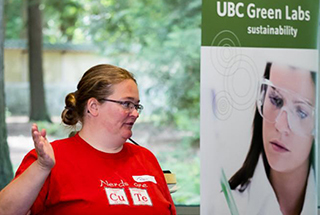 The university is investing $1 million to seed the new green revolving fund, designed to encourage the community to look at the entire campus as a laboratory, classroom and testing ground for energy-saving ideas. The idea originated from a 2012 student-led research project suggesting the fund could offer a payoff to the university in cost savings, innovation, learning opportunities and create a greener campus. The community college was recently lauded by the League for Innovation in the Community College, an international nonprofit organization that cultivates innovation at community colleges, for its sustainability and energy savings across the college's three campuses including 51 buildings and 1.6 million square feet. The university's new green revolving fund is a student-driven investment fund that will be used to implement energy efficiency and sustainability projects on campus. The idea and plan for the fund came from a course in the university's School of Business that introduces ideas for how sustainable practices can generate a competitive business advantage. The two-floor, 23,000-square-foot center features a commercial teaching kitchen where food from the gardens and greenhouses will be prepared using inductive heating, recycled through a heat loop. Power is generated from a mix of solar panels and two, highly efficient, natural gas-powered turbines that feed electricity to the campus grid. Some of the building's walls are earthen using soil from the campus. To reduce water in the university's chemistry labs, undergraduate Alex Schoeddert in collaboration with faculty member Sarah Pelletier built a water reuse system that will save up to 1,900 gallons of water each year. 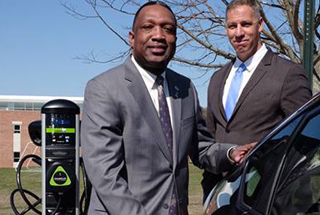 The university's new partnership with the New York Power Authority will result in a 217-kilowatt solar electric system with a hybrid power converter and battery storage for use during emergencies and times of peak demand. (Sweden) Announced in April 2016, the university topped the Swedish Environmental Protection Agency's assessment of environmental management. Environment certification, staff training, renewable energy requirements and reduced energy consumption are some of the criteria on which the assessment was based. The Swedish University of Agricultural Sciences came in second. The American Institute of Architects (AIA) and its Committee on the Environment (COTE) have selected UC Berkeley's Jacobs Institute for Design Innovation and University of Wyoming's Visual Arts Facility as examples of sustainable architecture and ecological design projects that protect and enhance the environment. These are two of 10 buildings that received the COTE Top Ten Award, the AIA's recognition program for sustainable design excellence. 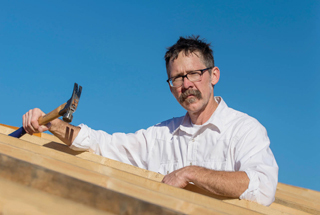 Prairie View A&M University was named Grand Winner in the U.S. Department of Energy's collegiate competition engaging university students to design zero-energy ready homes. First and second place winners were named in four other categories. A major goal of the competition is to advance building science curriculum in university programs across the country. The soon to open R.W. Kern Center has been designed not only to make all of its energy needs, but to provide its own water and treat its own waste. 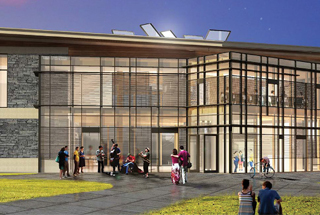 The college's goal is for the building to earn the Living Building Certification (LBC), which requires the creation of a net-zero energy, waste and water building. Earning Silver certification in the LEED for Existing Buildings category, American University's Gray Hall features LEED-approved air-quality levels, adherence to a green cleaning program, water-efficient sinks, toilets and landscaping practices. The building uses 100 percent renewable energy via renewable energy credits and offsets. 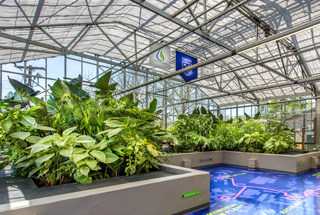 The US Water Alliance announced Emory University as one of three organizations to win top honors for its WaterHub campus-scale water reclamation project. The WaterHub is a wastewater reclamation system that allows the university to clean effluent and reuse nearly 300,000 gallons of campus wastewater daily. 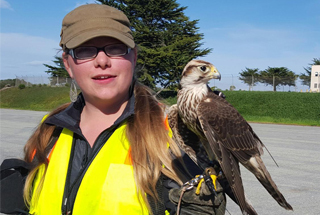 As the university prepares for demolition of some buildings, it is using a technique called bird abatement where birds of prey, in this case falcons, are used with handlers to deter other avian friends from making homes in the vacant, soon-to-be torn down structures. Simulating hunting patterns, the falcons do not hunt the other birds, their presence provides enough of a threat to warn other birds not to nest. If a nest is completed or found with eggs in or near any of the buildings, the demolition will have to be halted until the eggs hatch and the birds mature enough to fly on their own. 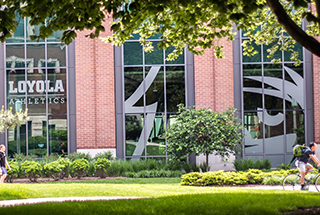 Led by the university's Sustainability Office and Physical Resources, the university recently signed a contract with Johnson Controls, Inc., that includes solar installations and energy system upgrades. Energy conservation measures indicated in the agreement include lighting retrofits using LED technology, low-flow water fixtures, demand control ventilation, solar electricity and hot water, and ground source heating and cooling. The university's 12,000-square-foot marine lab in Beaufort, N.C., features natural light and ventilation, reduced water use, use of permeable, light-reflecting materials for walkways and other exterior surfaces to reduce runoff and heat-island effect, and energy-efficient heating and cooling.